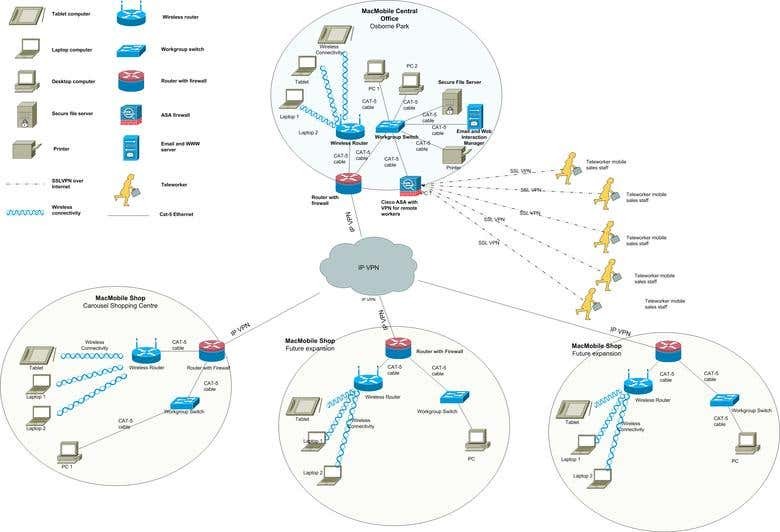 The network topology for MacMobile’s extended network is based on the Cisco enterprise model. This model divides the network into Access, Aggregation and Core Layers. In addition a layer of connectivity for the remote users has also been provisioned. This network topology is scalable, as in it allows for future expansion on central and remote offices. The central and remote offices are connected via IP-VPN which is less costly and better quality that using Internet. It also provides a layer of security as the traffic between the various sites is not exposed to the Internet. The network is comprised of several parts including PAN, LAN and WAN, each of these parts plays an important role in providing connectivity to the users, devices and offices in the Mac-mobile network.